On our first episode, Sam mentioned his work on the strange creature or creatures roaming around Lytham and St. Anne’s in the U.K. The reports range from a rabbit-like creature, to a linx, and even to a half-cat, half-dog creature. Is this a case of mistaken identity, or something much more interesting and rare? Another woman, who did want to be named, said: ‘I was walking along the drive when I saw it in the fields alongside. One theory is that it could be a muntjac deer, one of the last remaining from a herd brought to Lytham Hall by the local squire over a century ago. Illustrator Sam Shearon came up with his drawing after speaking to several witnesses. A spokesman for Lancashire Police said: ‘We have checked local zoos and farms, but nothing seems to be missing. It is very bizarre. Apparent sightings of animals not native to the UK have been on the increase in recent years. Panthers are occasionally reported, with police marksmen called in last year after a farmer said he saw a large black cat on his land in Anglesey, North Wales. At RAF St Mawgan in Cornwall, three members of staff spotted a large black cat – similar to a puma or panther – through their nightvision lenses. 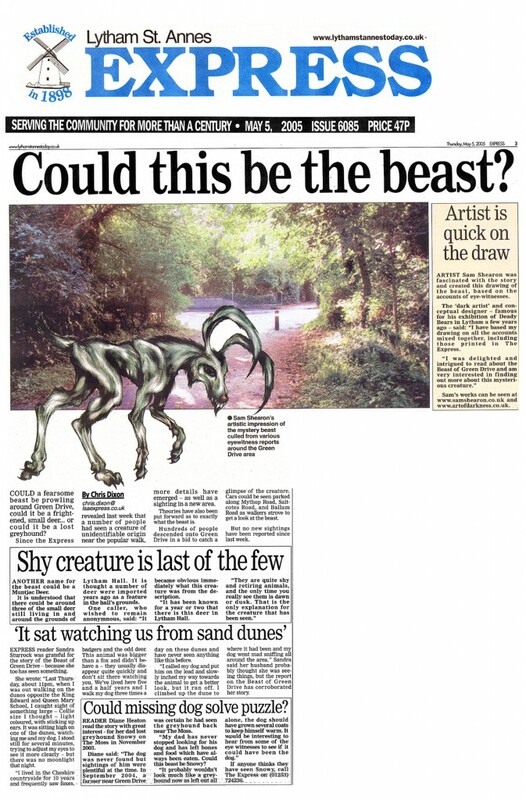 Also in Cornwall, the infamous Beast of Bodmin is still believed to be roaming farmland killing sheep and lambs. Experts at Chester Zoo were baffled after being shown the drawing of the The Beast of Green Drive. What do you think it was? Here are some other interesting tidbits Sam has shared, including the Animals Act of 1971 in the UK and a great article, When Exotic Pets were the Accessory Du Jour with pics included on the various exotic pets held by those who could afford them, including Salvador Dali’s pet Anteater. Thanks, Sam!